When Lisa Albiston left school she was looking for a career that would take her into largely uncharted territory for a girl. A female electrician living nearby at Te Aroha provided the inspiration for Lisa to go for an electrical apprenticeship with Mighty River Power. 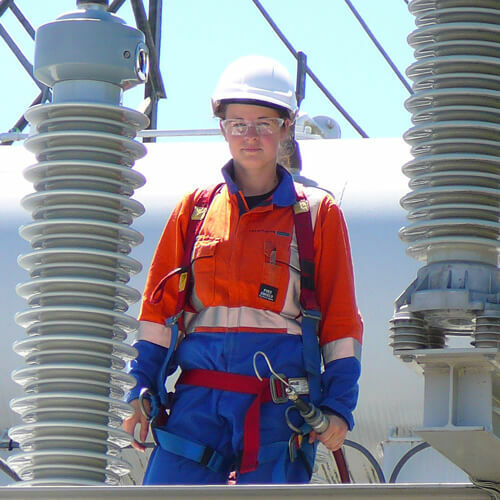 Today, six years down the track, Lisa is a registered electrician, having completed Level 4 in Electrical Engineering and Electricity Supply and, in September 2009, took up a trainee technician job with United Group, where she undertook further training to achieve Level 5 as a high voltage Protection Technician. faults are critical to maintaining electricity supply. Lisa has never looked back since deciding to become a registered electrician and Protection Technician. Her three-year training within the Mighty River apprenticeship Program was largely on-the-job but with the six, three month blocks at Manukau Institute of Technology and WINTEC, she was taken all over the country and this gave her a taste of the many different aspects of the industry. “What’s really cool is doing different kinds of work every day and getting around and seeing the country,” says Lisa. Westfield Mall. While in Taranaki she worked on the commissioning of the new Kupe gas field supply. But it was her work experience with United Group on high voltage maintenance in sub-stations that grabbed her interest the most. United Group’s Maintenance Manager Stephen Spry says his company was so impressed with Lisa that they offered her a job and the opportunity to undertake further training when she completed her MRP apprenticeship. “Lisa showed a lot of aptitude and is not fazed by working in a male oriented business. She’s a joy to have on board. She’s likeable and doesn’t put up with any nonsense,” says Stephen.